The Belgian senator Philippe Monfils (MR) has presented a few weeks ago a project (in french) for a ? 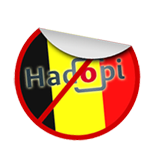 ?HADOPI|Haute autorité pour la diffusion des œuvres et la protection des droits sur internet? ?-like 1 law in Belgium. This law aims at condemning people who share copyrighted works without going to court. If an internet user’s connexion is used for illegal filesharing, she will first receive a warning, then a fine. The third step proposes a limitation of bandwidth. The last one is the complete suppression of that person’s internet connection (but she still has to pay for that connection). In the facts this arises a lot of questions and fears about the freedom to access the Internet but also about the means used to prove the facts. An IP address isn’t enough to prove anything, considering how easy it is to break into a WiFi access point, even a secured one. It also raises the problem of the conviction that will affect a group of people (whole families, businesses,…) for the crime of a single person. There is also a chances of double penalty (the obligation to continue to pay the fees for a suspended Internet access) and there is also the possibility that somebody gets convicted for counteracting while his neighbour only gets a warnings for the same infraction and thus breaking an equal justice. Also, will such a law really help artists (or the entertainment industry)? There is no proof that it will encourage people to buy more discs and moreover how can anybody buy anything from legal sources without an internet access? What is sure is that this will cost lot of money for results that are not proven. Hadopi Mayonnaise is a group of concerned citizens that want to open the dialogue about this law. If you want to help them you can visit NURPA 2 website. They are currently looking for translation for both websites in Dutch. This entry was posted in Nerdzage on 21/02/2010 by bigon.